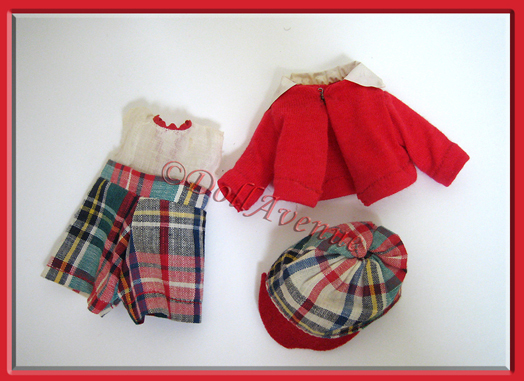 1952 Vogue Ginny Brother and Sister Series "Steve" #35 Outfit. The outfit is HTF in complete condition and consists of a one-piece plaid cotton short set with attached while pique top trimmed in red rick rack and closing in the back with a hook and eye. The short set is in crisp, clean condition. Red Jersey knit jacket with white vinyl collar is tagged with the skinny Vogue script tag. Plaid coordinating hat with red felt visor is just adorable! All outfits can ship in a padded envelope via First Class mail- I will refund any overage postal cost after you complete checkout. This outfit can be seen on page 104 of the 2nd Edition of the Collector's Encyclopedia of Vogue Dolls by Izen and Stover.